Presumptive Democratic presidential nominee Hillary Clinton (left) locks hands with Massachusetts senator Elizabeth Warren at the start of a campaign rally held at the Cincinnati Museum Center at Union Terminal on June 25th. In a move that belies the importance of Ohio's role in the upcoming general election for president, the Democratic Party offered up two of their most influential members during a 90-minute campaign rally at the Cincinnati Museum Center at Union Terminal this past Monday. Presumptive nominee Hillary Clinton, making her third appearance in the Buckeye State within a two-week span, was greeted by an overflow capacity crowd that had already been warmed up by fiery remarks from the campaign's most recent and most progressive surrogate, Massachusetts freshman senator Elizabeth Warren. 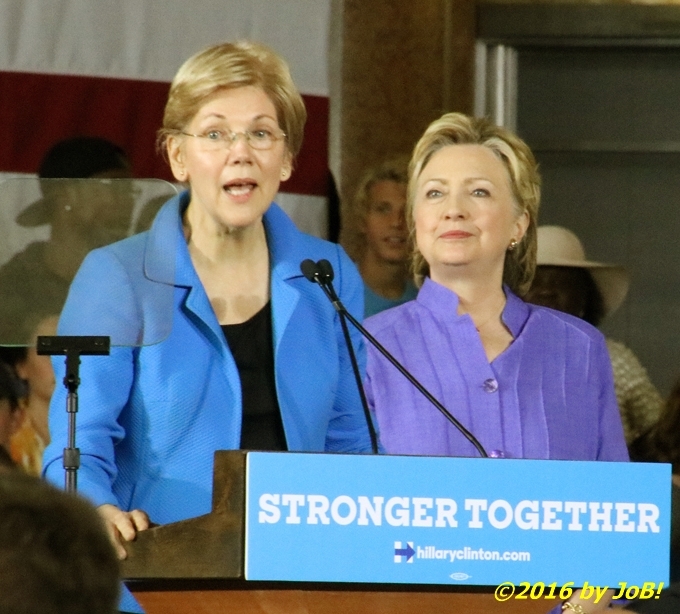 Massachusetts senator Elizabeth Warren, left, addresses the crowd at the Democratic campaign rally for the party's presumptive presidential candidate Hillary Clinton, right, at the Cincinnati Museum Center at Union terminal on June 25th. 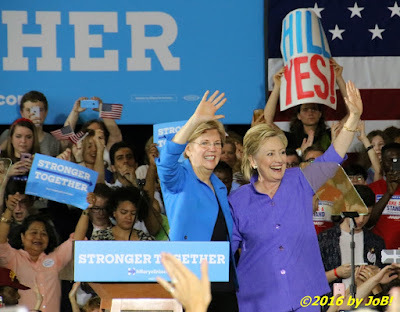 Once the only female Democratic senator to withhold her endorsement of the former US Secretary of State and New York lawmaker, Warren has come to Clinton's aid with several solo campaign events in recent weeks but this was the first time that both women have appeared together during this cycle. She brought the Cincinnati crowd to their feet when she formally made that long-awaited formal proclamation. "I'm here today because I'm with her. 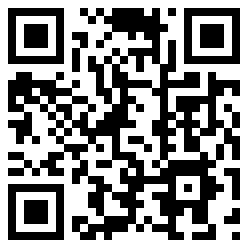 Yes, her," the Massachusetts senator enthusiastically stated. 'We’re all here today because we’re with her and we’re going to work our hearts out to make Hillary Clinton the next President of the United States!" 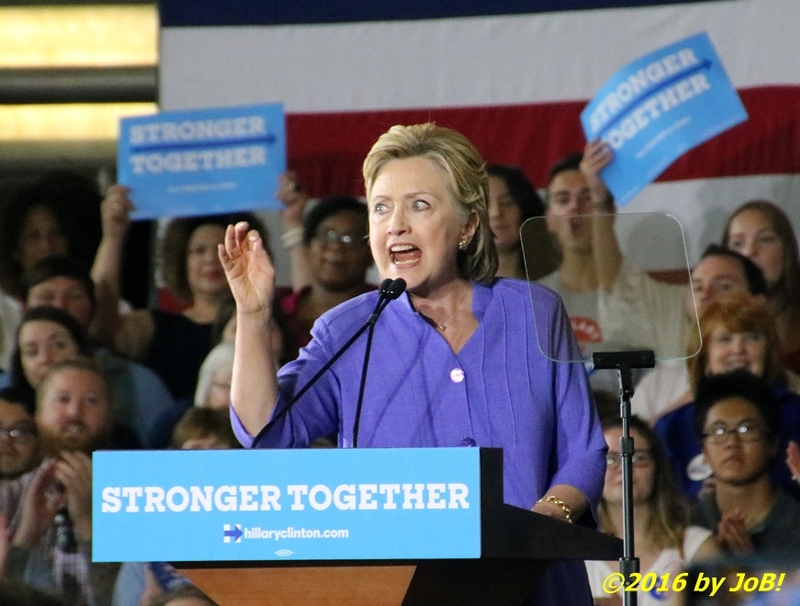 Democratic presumptive presidential nominee Hillary Clinton delivers remarks at the party's campaign rally held at the Cincinnati Museum Center at Union Terminal on June 25th. As she continued with her impassioned remarks, Warren did not hold back on her attacks of Republican presumptive nominee Donald Trump. "What kind of a man does that? ", she asked the crowd when bringing up Trump's recent self-centered comments regarding the 2008 recession, the previous week's "Brexit" vote in the United Kingdom, and continued legal issues with his now defunct for-profit eponymous university. "I’ll tell you what kind of man: a small, insecure money-grubber who fights for nobody but himself." Massachusetts senator Elizabeth Warren (left) and presumptive Democratic presidential nominee Hillary Clinton (right) wave to the crowd at the conclusion of a campaign rally held at the Cincinnati Museum Center at Union Terminal on June 25th. During Clinton's time at the podium, she continued her campaign's recent adoption of overtly disparaging her presumed November opponent's qualifications to serve as America's next leader. Citing Warren's ability to "get under Donald Trump's thin skin", the presumptive nominee added, "she exposes him for what he is: temperamentally unfit and totally unqualified to be president of the United States." With one of the leading voices on progressive matters flanking her on stage, Secretary Clinton conveniently mentioned her support for a rise in the minimum wage, debt relief for college loans and other economic issues considered important to that wing of the Democratic Party. 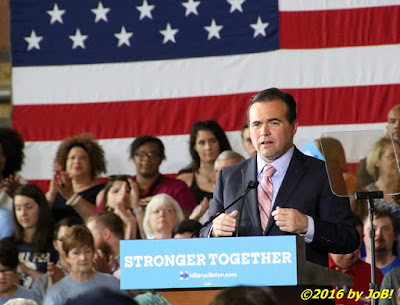 Mayor John Cranley, address the crowd before the start of the Clinton/Warren campaign rally held at the Cincinnati Museum Center at Union Terminal on June 25th. 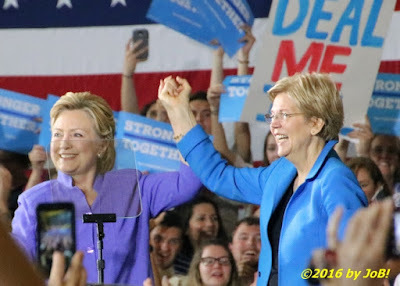 Bolstered by an unmistakable chemistry that was evident during this rally, speculation will certainly grow in the weeks leading up to this month's convention over the potential of a Clinton/Warren ticket to run against Trump and his yet-to-be-announced running mate. 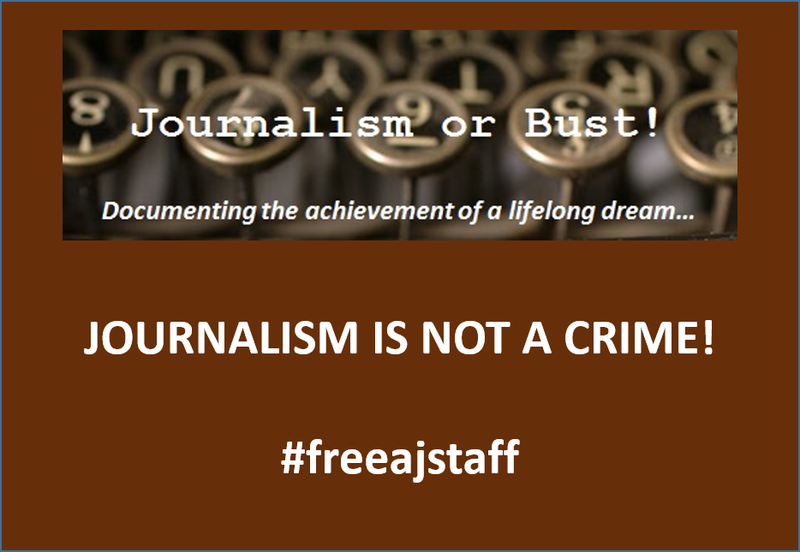 She would join a list rumored to be populated by several of her US Senate colleagues (Virginia's Tim Kaine, Ohio's Sherrod Brown, and New Jersey's Corey Booker) as well as two current Obama administration cabinet officials (HUD secretary Julian Castro and labor secretary Tom Perez). The campaign's decision is not expected to be announced until that Philadelphia event starts on July 25th. 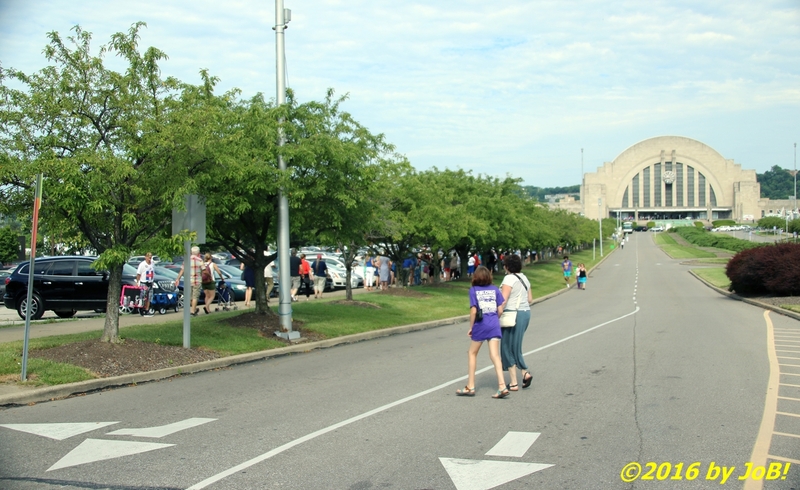 Overflow crowds lining up to gain admittance to the Clinton/Warren campaign rally held at the Cincinnati Museum Center at Union Terminal on June 25th. 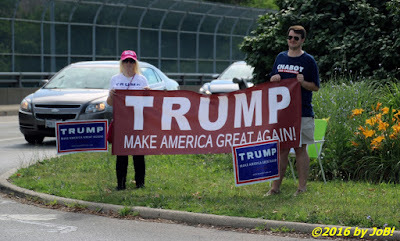 Ohio's swing state status holds true again this presidential cycle with recent polling showing the race to be extremely close at this pre-convention stage. As of the time of this posting, RealClearPolitics data shows Clinton with a 2.5 percent advantage over her presumed Republican rival. With the primary season over, the campaign has purchased significant ad buys in Ohio and other battleground states to transition towards their general election message and opponent. In a bid to counter this Democratic event, the Trump campaign announced on Saturday an appearance by the candidate at a convention center in the Cincinnati suburbs on July 6th to help shore up support in this traditionally conservative portion of the state. A handful of supporters of Republican presumptive presidential nominee Donald Trump stood just across the street from the Cincinnati Museum Center at Union Terminal during the Clinton/Warren campaign rally on June 25th.